The prenatal condition offers a unique possibility of examining physiological interaction between individuals. Goal of this work was to look for evidence of coordination between fetal and maternal cardiac systems. 177 magnetocardiograms were recorded in 62 pregnancies (16th–42nd week of gestation). Fetal and maternal RR interval time series were constructed and the phases, i.e. the timing of the R peaks of one time series in relation to each RR interval of the other were determined. The distributions of these phases were examined and synchrograms were constructed for real and surrogate pairs of fetal and maternal data sets. Synchronization epochs were determined for defined n:m coupling ratios. Differences between real and surrogate data could not be found with respect to number of synchronization epochs found (712 vs. 741), gestational age, subject, recording or n:m combination. There was however a preference for the occurrence of synchronization epochs in specific phases in real data not apparent in the surrogate for some n:m combinations. The results suggest that occasional coupling between fetal and maternal cardiac systems does occur. In the human life cycle, there is no time when two individuals are more closely physiologically intertwined than in the period before birth. The prenatal condition thus represents a unique opportunity to investigate physiological interaction between two individual organisms. With respect to cardiac interaction, evidence exists that indicates an influence of the maternal condition on fetal heart rate. For example, it has been shown that reduced PO2 in the mother may lead to hypoxemia, increased blood pressure and a decrease in heart rate in the fetus . Furthermore, Bedekam and coworkers, studying growth retarded fetuses, found an increase in fetal heart rate variation accompanying increased body and respiratory movements under conditions of maternal hyperoxygenation . Also maternal hypothermia has been associated with fetal bradycardia . It has further been shown that the fetus reacts to sustained maternal exercise with a moderate increase in baseline heart rate . Direct cardiac interaction was postulated by Hildebrandt and Klein in 1979  on the basis of phase coordination between maternal and fetal heart rhythms. They obtained fetal and maternal ECGs in 4 pregnant women in the 8th and 9th month of pregnancy. The quality of the data of two of these subjects, acquired during the night, permitted analysis of 85 sets of 100 consecutive maternal beats. In these sets, the distribution of the timing of the fetal R times relative to the maternal RR interval was determined. Of these distributions, 25% showed a deviation from a uniform distribution, reflecting primarily a 2:1 fetal/maternal HR ratio with fetal R timing relatively shifted to the maternal R peak by approximately 1/4 of maternal beat duration. Other evidence for the coordination of fetal and maternal cardiac activity was later published by Cerutti et al . Performing power spectral analysis on the RR interval time series of a mother and her fetus in the 39th week of gestation, they found a high correlation between the variation of the two signals around 0.1 and 0.33 Hz. This was confirmed in a later study of cross spectral analysis of the data of four subjects in the 36th week for a band around 0.3–0.4 Hz . The phenomenon was related to maternal respiration  and control mechanisms able to detect and adapt to minimal physiological signals were postulated . The evidence published thus far which suggests fetal-maternal cardiac interaction is based on only few cases. We examined concurrent fetal and maternal RR interval time series extracted from magnetocardiographic recordings in a relatively large sample covering the 2nd and 3rd trimester of pregnancy. The goal of this work was to look for evidence of coordination and to develop methods to aid in the identification and classification of such coordination. In particular the examination of simultaneously recorded fetal and maternal heart rates may reveal to what extent coordination exists between these two cardiac rhythms. Of the 177 data sets examined, 13 (7.3%) displayed nonuniform distributions of the timing of the fetal (resp. maternal) R peaks relative to the simultaneous maternal (resp. fetal) RR intervals (the first approach). Visual examination suggested fetal-maternal coupling ratios of 2:1 (6 data sets), 3:2 (5 data sets), 4:2 (1 data set) and 7:4 (1 data set). Examples are given in Fig. 1. The frequency of occurrence was the same for both the 2nd and the 3rd trimester (8.2% and 7.0%, respectively). Relative timing of R peaks. 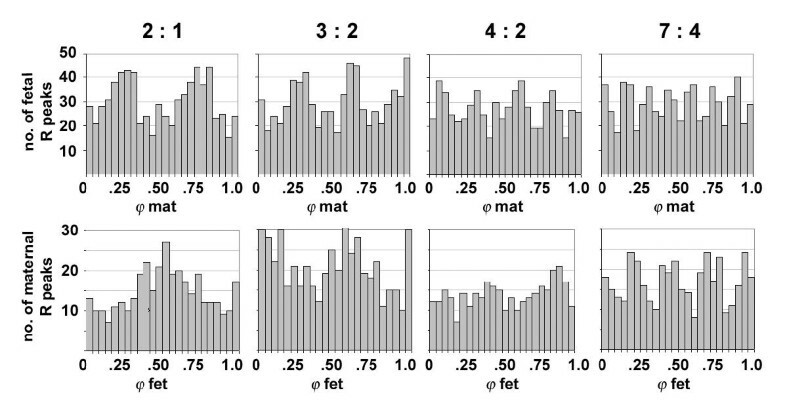 Sample histograms of the timing of the fetal R peaks relative to the simultaneous maternal RR intervals (φ mat , top panel) and of the maternal R peaks relative to the simultaneous fetal RR intervals (φ fet , bottom panel). The distributions are statistically nonuniform (p < 0.05). For the second approach, 712 synchronization epochs (SE) were identified in the real data, 741 in the surrogate data. The distribution of SE with respect to gestational age did not differ between real and surrogate data (Fig. 2, Table 1). 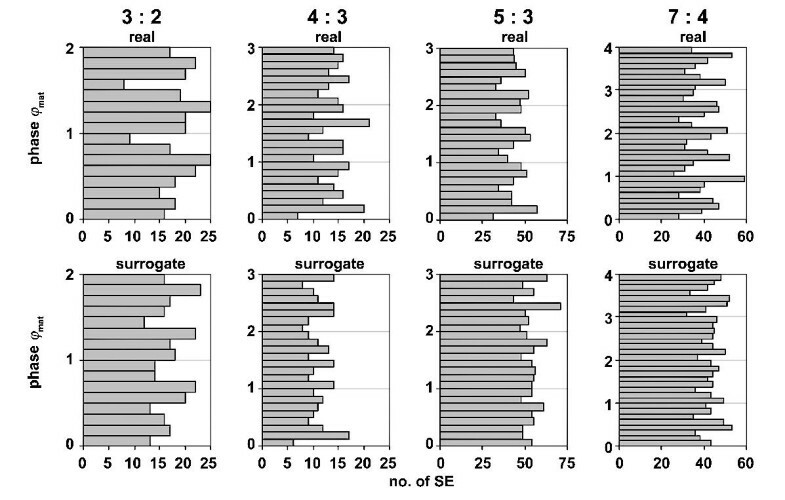 Also, no differences were found in the frequency of occurrence of SE in the real and surrogate data with respect to subject or data set (see Table 1). Subjects and synchronization epochs with respect to gestational age. Distribution of the number of data sets (black bars, left ordinate axis) and the number of synchronization epochs (SE) found (real and surrogate, light grey and dark grey bars, right ordinate axis) over week of gestation. Number of synchronization epochs in the real and surrogate data. Number of synchronization epochs (SE) found in the real and surrogate data: overall, in the 2nd and 3rd trimester, per subject, per data set and for each n:m combination. There were no obvious systematic differences between real and surrogate data with respect to the distribution of the SE in the n:m combinations: some combinations had more SE in the real data, some more in the surrogate. As can be seen in Table 1, of the four combinations which contained >50 SE in the real data, 4:3 and 3:2 had fewer SE in the surrogate data (18 (21%) and 7 (7%) less, respectively) and 7:4 and 5:3 had more (19 (11%) and 51 (25%) more, respectively). 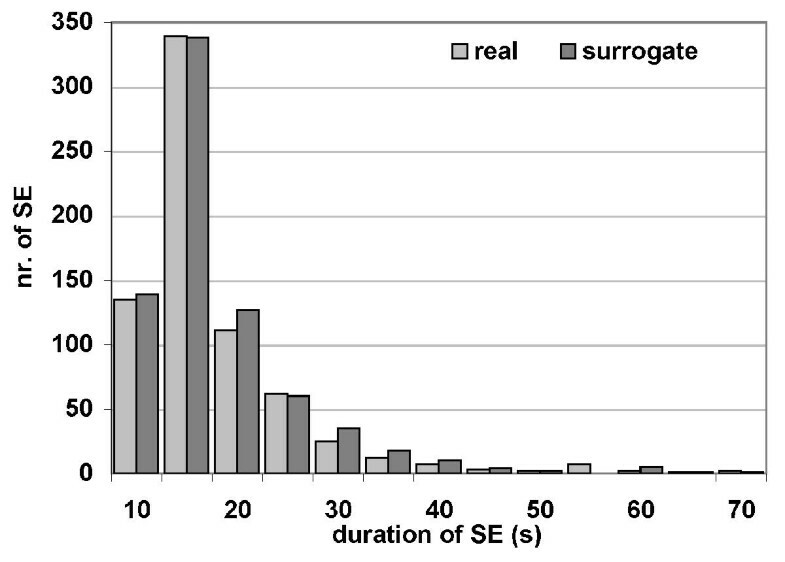 The duration of the SE did not differ between real and surrogate data (15.5 ± 8.9 s vs.15.5 ± 8.3 s). Most of the SE were between 10 and 25 s long (see Fig. 3). Duration of synchronization epochs. Number of synchronization epochs (SE) of different duration found in real and surrogate data sets. Looking for a preference in the timing of the fetal R peaks relative to the maternal RR cycle led to varying results. Inspection of the distributions of the phases φ mat of the combinations 5:3 and 7:4 showed a bias for the occurrence of SE in specific phases in the real data but not in the surrogate (Fig. 4). This was not obvious for the combinations 3:2 and 4:3. These observations were confirmed by comparing the phase distributions of the SE in the real and surrogate data for each combination on the basis of the Chi2 test: 3:2, p = 0.95; 4:3, p = 0.96; 5:3, p = 0.09; 7:4, p = 0.03 (statistically significant). Phase of synchronization epochs. Number of synchronization epochs (SE) found over all subjects in specific phases for the combinations 3:2, 4:3, 5:3 and 4:7 in both the real and surrogate data sets. Note the presence of peaks and troughs in the real 5:3 and 7:4 combinations (5 and 7 peaks, respectively), not obvious in the surrogate combinations. In this study we applied several different approaches in investigating the relationship between concurrent fetal and maternal heart rates. Emulating the procedure used by Hildebrandt and Klein , we examined the histograms of the relative timing of fetal and maternal R peaks. We found less evidence for a coordination of fetal and maternal heart rates than they did: only 7% had nonuniform distributions (compared to 25% in ). This may have been due to differences in the time of day, gestational age or in the number of data sets examined. On the other hand, we may presume that the length of the data sets played a role: taking 5 minutes of data, as we did, may well have smeared out brief episodes of consistent R peak timing. Inspection of the synchrograms showed numerous short-lived episodes, usually less than 40 s (Fig. 3), often with offset phases which would make their identification difficult when regarding longer periods of time. Indeed, detailed examination of the data set with the 4:2 RR interval ratio shown in Fig. 1 revealed several SE with a ratio of 2:1, relatively phase shifted by 90°. This points out a weakness of the Hildebrandt and Klein method of analysis and simultaneously endorses the appropriateness of stroboscopic technique in order to enable the detection of epochs of heart rate coordination. The latter allows the beat-to-beat inspection of the relationship between the two heart rates. Quantifying the episodes with phase synchronization led to an unexpectedly high number of SE in the real data, independent of data set, subject or gestational age: only 13 of the 177 real data sets displayed no SE at all. If we were to interpret episodes of phase synchronization in the real data with a duration greater than 10 s as reflecting physiological interaction between the fetal and maternal cardiac systems then one might conclude that such interaction occurs persistently during the 2nd and 3rd trimester of pregnancy. However, in the surrogate data, in which physiological interaction may be safely excluded, the results obtained were very similar, suggesting that the presence of SE in most, if not all, of the real data must be explained by other means. One possible obvious such explanation lies in the simple numerical nature of comparing the oscillation rate of two independent oscillators whose frequencies may vary over time. At any instant in time, the ratio of their rates can be determined and episodes of synchronization can be postulated simply on the basis of coincident stability of the rates over defined periods of time. One may thus ask whether there is any basis to expect the heart rates of mother and fetus to have a reciprocal influence on each other and, if so, how can one distinguish between synchronization reflecting this interaction and spurious episodes of whole number heart rate ratios. With respect to the former, the empirical evidence in the prenatal setting that we are aware of, given in the introduction above, is sparse. However, other evidence exists which suggests that an individual's heart rate may synchronize to external stimuli. For instance, Anishchenko et al  exposed adult subjects to a weak forcing signal in the form of visual and acoustic stimuli. These were either periodic, the detuning frequency being close to the subject's heart rate, or aperiodic, the detuning frequency corresponding to another person's heart rate. In both cases they found evidence of frequency locking to the external signal. Considering that, by the 27th week of gestation, the fetal auditory system is sufficiently developed and capable of perceiving the frequency range of vessel pulsation , it is conceivable that the maternal cardiac oscillator has a detuning effect on the fetal rhythm. On the other hand, one may postulate that mechanical energy from pulsating vessels may be transferred to the fetus and result in a forcing effect on the fetal cardiac oscillator. Studies demonstrating a synchronization between cardiac and locomotor rhythms [10, 11] have been reported. Although direct evidence of an explanatory mechanism has yet to be presented, one explanation that has been considered is that rhythmic movement plays a role in this coupling. It is possible that a similar effect may be present in the womb. If interaction between the two cardiac systems takes places, the question remains as to how to distinguish the SE identified under these conditions from those resulting from coincident heart rates not reflecting synchronization. We examined one possibility which assumes that, in the case of synchronization, the relative timing of the maternal and fetal beats will tend to display a preferred phase relationship. We found an SE bias for specific phases in the 5:3 and 7:4 combinations in the real data which were not evident in the surrogate data. We take this as an indication that at least some of the SE in the real data could reflect cardiac interaction between mother and fetus. As the 5:3 and 7:4 combinations were the two with the highest number of identified SE, one may suppose that some SE in the other n:m combinations may indicate snychronization but that their number was insufficient to produce a statistical trend. A number of reasons may be forwarded to explain the low number of 'true' SE reflecting physiological interaction. It is reasonable to assume that synchronization occurs under specific physiological conditions such as fetal behavioral state, maturation or maternal status. We performed the FMCG measurements under non-selective conditions, i.e. we did not control for all possible influencing or modulating factors such as those mentioned above. This may mean that only a few, if any, measurements were recorded under adequate synchronization conditions, explaining our difficulty in identifying true SE. The fact that Hildebrandt and Klein  found appreciably more nonuniform distributions than we did, may be due to the fact that they registered data during night sleep while our data were collected during the day. This study focussed on attempting to identify short-lived episodes of fetal-maternal heart rate coordination in relatively brief recordings. Thus the physiological inputs which may entail the generation (or hindrance) of such coupling are restricted to those associated with short term heart rate fluctuations. For the mother this involves the low and high frequency modulations known to be associated with autonomic function, including the influence of factors such as respiration, body position and blood pressure . In the fetus, heart rate variability is low earlier in pregnancy and higher variability is associated with the development of the fetal autonomic nervous system as well as increased activity and respiratory movements . Long term recordings (or recordings performed after a longer adaptation period) might permit the creation of conditions more amenable to the initiation of synchronization. Several factors could be of importance in the manifestation of synchronization. The mechanism leading to coupling, whatever form it takes, may, more often than not, be too weak to induce interaction. Furthermore, the respective heart rate frequencies may be too far apart. On the other hand, the frequencies may be too instable over time so that the coupling does not manifest itself. This points to another possible criterion which may help in the identification of true SE: if synchronization is found over an interval in which the variabilities of the heart rates are high then we may presume that we are not dealing with spurious numerical combinations of transient fetal and maternal heart rates. We have proposed this concept within the context of cardiorespiratory coordination  and have found it supported in fetal-maternal simulation studies . In summary, on the basis of the data analyzed here we cannot unconditionally conclude that fetal-maternal heart rate synchronization exists. However, there is reason to expect such interaction under favorable conditions on the basis of other reported work. Indeed, evidence could be presented in this paper which suggests that occasional coupling between fetal and maternal cardiac systems does occur. Further work should focus on the discrimination of spurious and true episodes of synchronization. The data of 62 pregnant women (age: 30.3 ± 5.1 years; 30 nullipara, 24 primipara and 8 multipara) collected between 16th – 42nd week of gestation were available for analysis. The pregnancies included 35 normal healthy fetuses, 21 with suspected growth retardation and 6 with isolated ectopic beats or short-lived bradycardias. Fetuses with persistent arrhythmias were excluded. Altogether 177 magnetocardiogram recordings (MCG) were obtained, 49 in the 2nd and 128 in the 3rd trimester (see also Fig. 2). Recordings during normal pregnancy totaled 139, 30 in suspected growth retarded fetuses and 8 in fetuses with isolated ectopic beats or short-lived bardycardias. The study was approved by the local ethics committee and all mothers gave written informed consent. Magnetocardiography noninvasively registers the magnetic component of cardiac electric activity. We recorded MCG using a 61 channel biomagnetometer (Magnes 1300C, 4D-Neuroimaging, San Diego). As can be seen in Fig. 5, this system enables the simultaneous acquisition of both the fetal and the maternal MCG signal as the sensors are arranged concentrically on a slightly curved surface (rc = 52 cm) with 800 cm2 area of coverage . Coil diameter is 28 mm with a spacing of approximately 38 mm. The coil distance to the outer surface is ≤ 16 mm. Environmental noise cancellation is possible on the basis of ambient noise detectors. Intrinsic system noise is specified as average over frequency and across all channels. To further reduce the influence of electromagnetic artifacts the measurements were performed in a shielded room (Vakuumschmelze, Hanau, Germany). Subjects were in a resting, supine condition. The concave sensor was placed just above the mother's abdomen, the lower rim over the pubis and the upper rim approximately over the xyphoid. After an adaptation period of 10–15 minutes, data were recorded for 5 minutes at a sampling rate of 1 kHz and a band pass of 1–200 Hz. All recordings took place between 10 AM and 4 PM. Maternal and fetal magnetocardiogram. Simultaneous maternal and fetal magnetocardiograms recorded in the 36th week of gestation. A) signals in 61 channels, maximum maternal QRS amplitude in the upper channels, maximum fetal QRS amplitude just left of and above the center. B) relative timing of maternal and fetal R peaks in two selected channels: fetal (fR) in channel 7, maternal (mR) in channel 48 (pT, picotesla). In the raw data of the MCG signal, templates of both the maternal and fetal QRS complex were formed using 10–20 representative complexes (maternal and fetal, respectively) with a high signal to noise ratio. The fetal and the maternal R peaks were identified to an accuracy of 1 ms on the basis of the correlation to these respective QRS signal templates (see also Fig. 5). Using the timing of the R peaks, fetal and maternal RR interval time series were constructed and the timing of the R peaks of the one time series in relation to each RR interval of the other time series was noted. The relative timing of the fetal (or maternal) R peak with respect to the simultaneous maternal (or fetal) RR cycle is referred to in the following as the phase φ mat (or φ fet ). Several approaches were used to attempt the identification of coordination in each pair of fetal-maternal time series. First, the frequency distributions of both φ mat and φ fet were determined. These were visually examined for equally spaced peaks and troughs (see Fig. 1). The frequency distributions also were tested for uniformity and the ratio of fetal peaks to maternal peaks was noted for all nonuniform distributions identified (see also ). Second, synchrograms were constructed using the stroboscopic technique: the phases of the fetal R peaks (φ mat ) were plotted with respect to m maternal cycles (m ≥ 1) (for details see ). Compared to the method described above, this representation displays the phase of fetal R peaks within one or more maternal RR interval on a time axis. 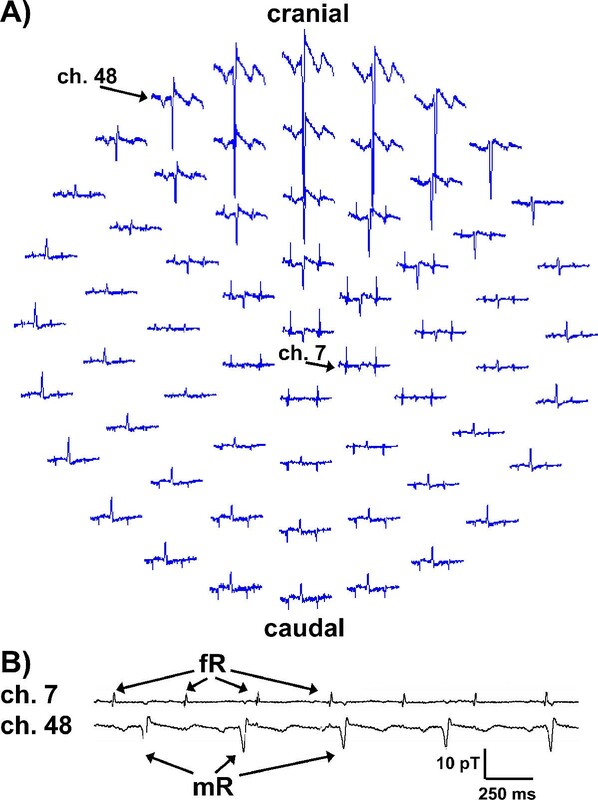 Horizontal groupings of data points indicate phase synchronization (Fig. 6, left panel). The number of parallel lines (n) in an epoch of such horizontal groupings embedded in m maternal RR intervals indicates the coupling ratio n:m. The synchrograms were visually inspected for such synchronization epochs (SE). 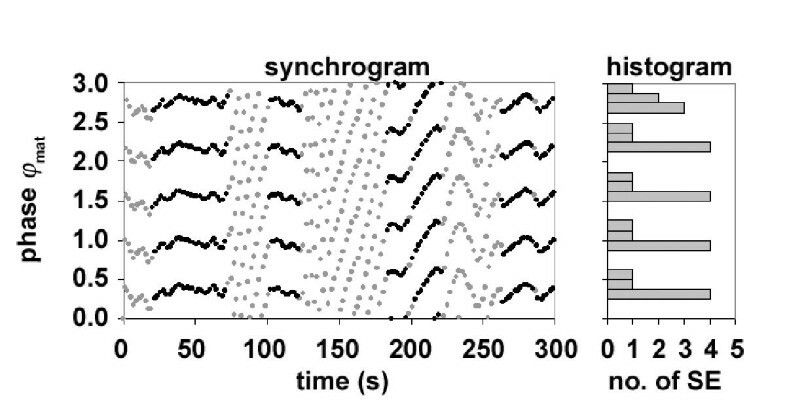 Time series, synchrograms and synchronization epochs. 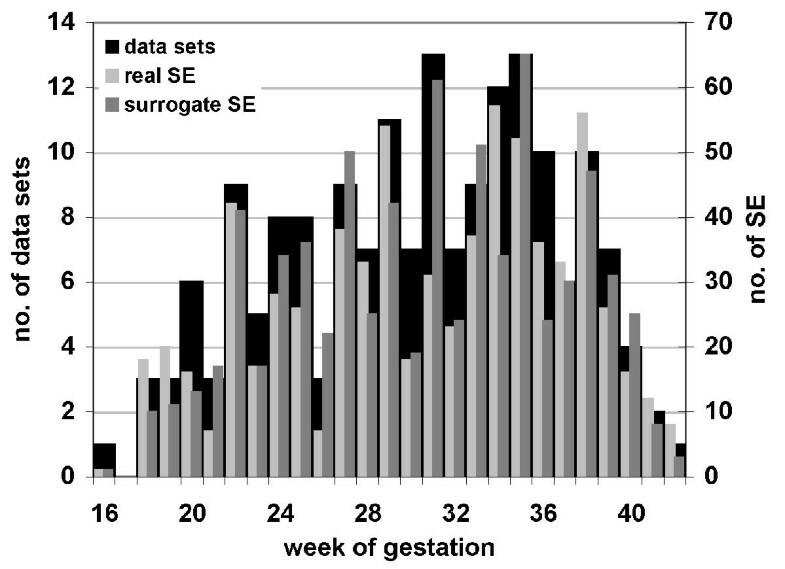 Real and surrogate data sets of a fetus in the 26th week of gestation. 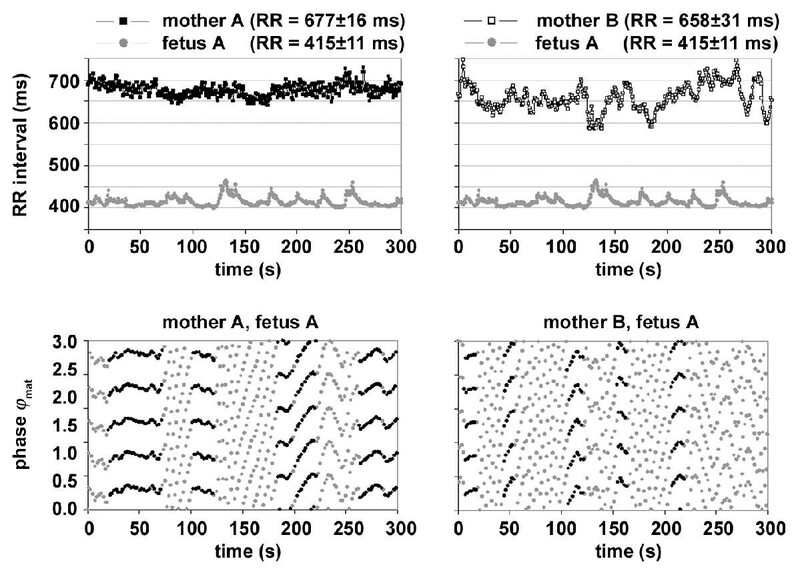 Top left panel: RR intervals of mother A and her fetus A, top right panel: RR intervals of another mother B and fetus A (respective mean RR interval ± SD indicated in parenthesis). Bottom panels: corresponding synchrograms for m = 3 demonstrating several epochs of a 5:3 ratio; the black points indicate quantitatively detected synchronization epochs (SE, see text). SE were also quantitatively determined according to the following procedure (for details, see ). For fixed combinations of n and m, the phase φ mat was determined for each fetal R peak (index i), the absolute difference δ i = |φmat,i- φmat,i + n| was calculated and a sliding window of length l was moved over all δ i . If, within the window, all δ i < threshold value α, an SE was considered detected (e.g. in Fig. 6, black points in bottom panel). The parameters were set as follows. n and m: a) physiologically plausible combinations of n and m were established based on the ranges of fetal and maternal RR intervals (95% confidence intervals: 366–479 ms and 477–960 ms, respectively); this led to n:m combinations ranging from 1:1 to 5:2 (~477:479 to ~960:366); b) the number of maternal cycles was restricted to a maximum of 4 (m ≤ 4); c) redundancies were avoided (e.g. 4:2 ≡ 2:1). This led to 10 n:m combinations (see Table 2). To avoid identifying short spurious epochs the window length l was set to 10s. The threshold value α was set to .03·m as this value seemed to discriminate well with respect to epochs identified visually. For each pair of RR interval data sets (mother and fetus), the number of SEs as well as their duration and n:m combination were determined. As the number of data sets of fetuses with suspected growth retardation or with isolated arrhythmic beats was relatively small and no differences between their results and those of the healthy fetuses were immediately apparent, the data were pooled. n:m combinations n:m combinations examined in this study. For each plausible combination, the value of m/n is given, bold type indicates non-redundant combinations, "—" = not physiologically plausible (see text). In order to investigate whether the SE found were produced by purely numerical combinations of transient fetal and maternal heart rates, surrogate pairs of data sets were constructed. To do this, we adopted a procedure introduced by Toledo et al which eliminates the coupling between pairs of data sets while preserving the intrinsic linear and nonlinear features of the individual signals . We randomly recombined maternal and fetal data sets, avoiding combinations involving a mother and her own child. The resulting pairs of RR interval data sets (fetus with a mother not its own) were analyzed as described above for the real data (see also Fig. 6). In order to examine whether there was a preference in the timing of the fetal R peaks relative to the maternal RR cycle, the phases φ mat of each SE found in each data set were determined in all data sets for both the real and surrogate data (example in Fig. 7). The distributions of these phases over all subjects were examined for the n:m combinations of which more than 50 SE could be found (3:2, 4:3, 5:3, 7:4, see Results). For each n:m combination, the number of histogram bins was set to 8·m, corresponding to a resolution of 8 classes per maternal beat. The distributions were visually inspected for a systematic bias for specific phases and the distributions of the real data were compared to those of surrogate data. Determination of the phase of synchronization epochs. Synchrogram of a real data set obtained in the 26th week of gestation. The identified SE are marked by the black points. The histogram at the right indicates the distribution of the phases φ mat of all synchronization epochs (SE) found in this data set. Note the bias for specific phases of the maternal RR interval. Values are generally expressed as means ± standard deviation (SD). The uniformity of the distribution in the histograms was tested using the Chi square procedure. Differences between the results obtained in the real and surrogate data were tested using the Mann-Whitney U-test or the Chi square test. p-values below 0.05 were considered statistically significant. PVL, DG and SL designed the study. PVL and SL recruited the subjects, collected the data and did the signal processing. DG developed the software for the data handling, synchrogram construction and determination of synchronization epochs. SL performed the statistical analysis. PVL, SL, DG, HB and DC all participated in the analysis of the results. PVL drafted the manuscript. HB, DC and DHWG were involved in the interpretation of the data and participated in the final revision.